Looking for something fun to do this summer? Grab a copy of our latest book club pick and join us at our next meeting! There’s no cost to join in and no commitment to attend every month! Complimentary wine tasting is included, but we ask that you come prepared to join in on the conversation! TAKE NOTE: This is a free social gathering, all are welcome to attend – but guests must be 21+ to drink. Thankful, Blessed & Wine Obsessed! It’s our 7th Anniversary, and this year we’ve got so much to be thankful for! As our family uses this month to reflect on how much we’ve learned, changed and grown in the last seven years, we want to thank you for all of your support & invite you to celebrate with us all November long! ♥ Share the Bounty! November 10 & 11, pay it forward with us as we donate to the Caregiver’s Ministry Food Bank of Immaculate Conception Church in Ransomville. Trade in one non-expired canned good for one taste of wine! Max 4 cans per guest. Trade in one bag of non-expired dog food for 4 tastes of wine! Max 1 bag per guest. Join us when we release the first wine from this year’s harvest! Our Book Club meets the 4th Sunday of the month at 6pm to discuss great books over great bottles of wine! No membership costs – simply read the book in advance to join in on the discussion. Space is still available (but going fast!) for our 2nd Annual Nouveau Night happening Thursday, November 15th! Inspired by the tradition of Beaujolais Day in France, this fun & festive event is a celebration of our local harvest & our upcoming 2018 Vintage! Call us at 716-731-3316 to make your reservation! We require payment in advance to provide a head count. Space is limited! December 1 – Start of NEW Winter Hours! Do you have your tickets for the Niagara Wine Trail USA‘s annual Harvest Fest weekend yet? Advance tickets are still available for just $22 / person and includes a tasting of 3 wines with a sample of a harvest themed dish at your choice of 10 participating wineries- that’s 30 wine samples and 10 food pairings! PLUS receive a commemorative wine glass from your starting winery! All bottles of Riesling will be 15% off when you purchase 3 or more during the event, plus our Savory Pumpkin Spice Chili Starter Seasoning will be available for purchase for you to replicate the dish (or give it your own twist!) at home! 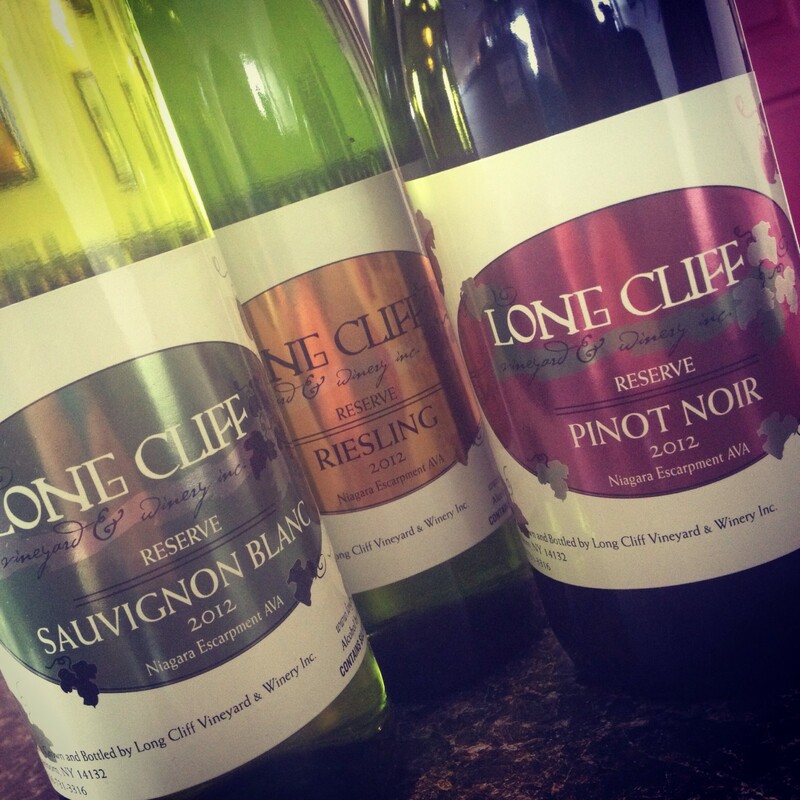 The best things in life are always worth the wait… After much anticipation, Long Cliff Winery’s signature semi-dry red blend, Blauer Himmel, is back again! But as you may remember, Blauer Himmel is extra special to the Long Cliff family for more than just its unique taste. It is a tribute to our sweet “Grandma Judy” who stood beside us as the vineyard was planted & supported Don’s dream of opening his own winery. Grandpa designed this wine especially for her. He purposely set out to craft a pizza/pasta wine made primarily from the “blue grape,” (Blaufrankisch) because it was her favorite color, and hid her name in grape vines across the top of our classic label design. Look closely and you’ll even spy a halo and angel wings in each of the four corners. Our first wine to ever sell out (not once but twice! ), having it return to the shelf just in time for our lucky 7th Anniversary feels like the perfect reminder that we’ve always got a guardian angel watching over this little #farmfamily. Raise a glass to our 2018 growing season and celebrate Autumn’s bounty with us at our 2nd Annual Nouveau Night! Our most talked about event of 2017 is back again – Join us Thursday, November 15th for the official bottling & release of the first wine from this year’s Harvest. Our Winemaker’s Reception begins at 5:00pm. Wine tasting & light hors d’oeuvres will be provided, and your $15 cover charge includes the cost of your very own bottle of 2018 Leon Nouveau – which you’ll get the personal opportunity to bottle & hand label yourself, straight from the tank. Every guest will take home the exact bottle they bottled (with opportunities for photos) and the chance to have the label autographed by our winemakers. Please call us at 716-731-3316 to make reservations. We require payment in advance to provide a head count. Space is limited! Sept. 15th – Visit our Wine Wagon Express at the Elmwood Village Farmer’s Market! Oct. 20 & 21 – Murder Mystery Weekend! Niagara Wine Trail’s Annual Hallowine Event!